The Fermi Paradox is a fascinating argument…it basically says, if the probability of life is so high in this universe, as it appears to be, where are all the other civilizations? Why is there no evidence of their existence? It’s a puzzle for sure, especially as more and more planets are found orbiting other stars. We’ve already discovered 861, and scientists estimate there are about 100-400 billion planets in this galaxy, of which at least 17 billion are Earth-sized (not all of those habitable). Well, there’s a great article on IO9 (click here) that details eleven possible answers to the Fermi Paradox. My favorite – though it’s also the scariest – is that we’re living inside a sort of computer simulation, one that just wasn’t created to have the same level of detail in the entire universe. Scientists have found what appear to be fossils resembling plankton inside of a meteorite that landed in Sri Lanka in 2012. It’s certainly not conclusive, as there’s even the possibility this meteorite was ejected from this planet in some larger impact long ago and just now fell back…but it’s an intriguing possibility. I think we’ll need many, many more examples of this before it starts to gain scientific credibility. 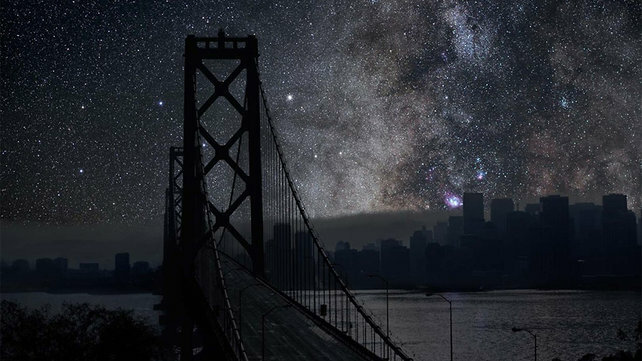 Artist/photographer Thierry Cohen has created some really cool images which show what several major cities worldwide would look like if there was no artificial lights (nor moonlight) masking the starry skies. The result is really cool and can be viewed at his website. He did this by shooting images of the night sky in places with similar latitude but no city lights, then overlaid them onto darkened photos of the cities themselves. Very cool. If you’re curious about dark energy, check out this short video giving a high-level overview of what dark energy is (well, at least what we know about it, that is…we don’t really KNOW what it is), and how scientists are working to learn more about it. There’s also a great FAQ on the subject at Discover Magazine’s website…it’s really long, but then, dark energy is a complicated subject! 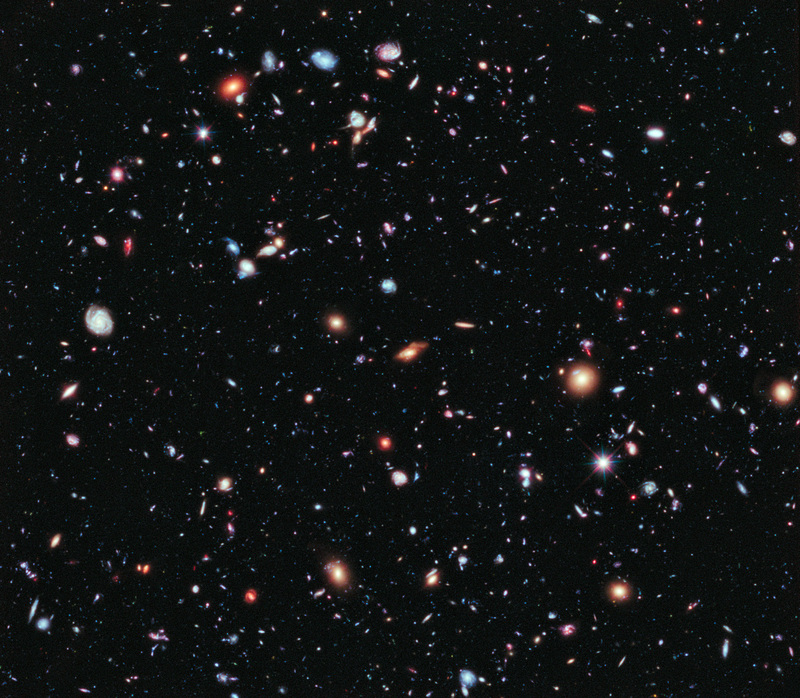 Hubble stunned us in 2009 with its incredible Deep Field Image. In a 48-hour exposure image covering about 1/15th the width of the moon, the Hubble Space Telescope captured thousands of galaxies. To put the scale in perspective, if the entire sky were photographed at this image size, it would result in approximately 30 million pictures. That’s a lot of galaxies! Anyway, in the time since the original picture, the telescope has been pointed at the same area of the sky again and again and the images combined, for a total image exposure time of around 23 days (two million seconds)! There are around 5500 galaxies visible in this image; you can view the full image by clicking on the thumbnail above. Read more in Discover Magazine. This is hardly new, but it’s worth sharing time and time again. It’s a time lapse video taken of the most amazing planet our species has ever laid eyes upon, as seen from the International Space Station. Nice to watch time and time again as a reminder of how awesome this planet is.